EVERYONE WANTS THE BOY TO PAY FOR HIS CRIME. ONLY ONE WOMAN WANTS TO SAVE HIM. Defense Attorney Sophie Giraudo is about to open a new legal practice in her hometown of San Sebastian, California, when the beloved governer is shot and seriously wounded during a celebration in the town park. The only thing more shocking than the crime itself is the identity of the would-be assassin: a seemingly gentle teenager named Donny. Driven by her desire to understand what could make a person with no history of violence suddenly commit such a terrible act, Sophie reluctantly agrees to take him on as a client, knowing that, at least, it will bring her some income. But soon she realizes that she also has personal motivations for taking the case: a desire to prove to her overbearing mother that she is not the reckless and self-destructive tennager she used to be, to prove to her ex-husband, who happens to be the prosecuting attorney, that she can win her case, and to prove to herself that the traumatic events of her adolescence no longer define her. As she digs deeper into Donny’s past, Sophie begins to suspect that he might not be the cold-blooded killer everyone thinks he is. Does Donny’s narcissistic mother really have her son’s best interest in mind? Is Donny’s mentor who runs Boys Into Men, a program for disadvantaged youths, the altruistic man he claims to be? Is Donny a deranged murderer, or a victim of his circumstances acting out of desperation? As Sophie races to uncover the truth, she is forced to come to terms with her past and to fight for what she knows is right…even if it means risking her reputation and possibly her life. 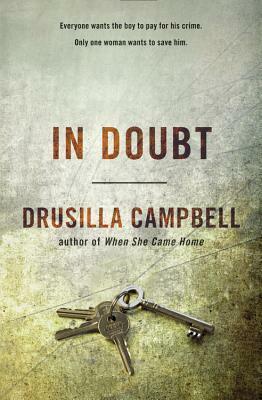 I’ve quite often come across Ms Campbell’s books in my library, but have never actually picked one up – in fact, I’ve even borrowed them at least once – but for some reason they kept getting shuffled to the bottom of the pile and then being returned unread. However, when I saw In Doubt in the automatic approval list at NetGalley, I was intrigued enough by the description that I took a chance and downloaded it. I will say that if I had seen the descriptor of Jodi Picoult meets John Grisham prior, I likely wouldn’t have downloaded it because neither of those authors are favorites of mine (in fact, I’m not a fan of the marketing method that compares one author to others, mostly because to me, they never seem to live up to the recommendation – or they far exceed it). This book seemed to be particularly apt with the amount of public shootings that have gone on the last few years, in particular, the shooting of Rep. Gabby Giffords in Arizona – but what if you looked at the shooter – quite often, we the public are so quick to judge the shooter, never really knowing what may have been gonig on in their background. Don’t get me wrong, I’m not saying, anything excuses the shooting and death of people, but there may be external reasons that affected the individuals behavior (and not just mental health ones, like is automatically assumed). In Doubt attempts to do just that. What happens when a defense lawyer decides to take on the case of a young man who shot and grievously wounded the governor. He never even denies doing it – but he also doesn’t know why. Without getting too much into a spoiler realm, Ms Campbell wove a story that was believable and made me feel sorry for Donny. I will say that I felt some of the storyline towards the end started to bordering a bit on the over angsty side – it went a bit too far for me – but that was only enough for me to drop my original rating from 4 stars, down to 3.5. Camp is over and Jonathan Cooper returns home—to life with his mother whose silence is worse than anything she could say, to his varsity soccer teammates at East Bay Christian Academy, to the growing rumors about what he did with a boy last summer at Bible camp. All the important lines blur. Between truth and lies. Between friends and enemies. Between reality and illusion. Just when Jonathan feels the most alone, help arrives from the unlikeliest of sources: Frances “Sketch” Mallory, the weird girl from his art class, and her equally eccentric friend, Mason. For a short while, thanks to Sketch and Mason, life is almost survivable. Then Ian McGuire comes to town on the night of the homecoming dance and tensions explode. Fists fly, blood flows, and Jonathan—powerless to stop it—does the only thing he believes might save them all: he prays for God’s grace. When I finished Caught in the Crossfire a couple of months ago, I was intrigued to see how Ms Rich was going to continue Jonathan’s story and with Searching for Grace, she didn’t disappoint. 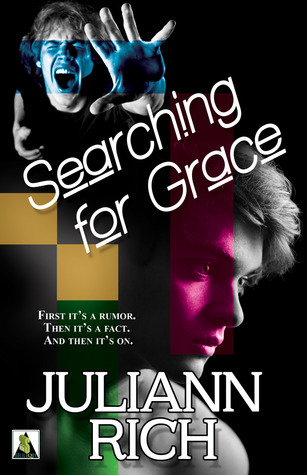 Searching for Grace picks up almost immediately following the conclusion of Caught in the Crossfire, when Jonathan returns home from summer camp, away from Ian and struggling with thoughts and feelings in direct conflict with how he was raised in his chuch (as a note, I’m not acknowledging that it is right or wrong, but that is how it is presented). I will admit that I was a little bit confused at the beginning with how the story was being told because it appeared to be in a flashback format but it wasn’t easy to identify. And it was weird/ hard for me in trying to figure out who Grace was, but about halfway through, it clicked for me and I liked how the author continued to address the conflict between religion and feelings/love. The cast of secondary characters in Searching for Grace were much more well-developed to me than the ones in Caught in the Crossfire (not saying that they were bad but I just enjoyed the SfG ones more). I loved that the author worked Simon from CitC into this story because I felt like he was one of the stronger characters in the first one, along with Jonathan. But for me, the duo of Sketch and Mason were the top. They kind of reminded me of Janis and Damien from Mean Girls (if you haven’t seen it, they are the duo that take Cady under their collective wing before she becomes entangled with the mean girls). I loved how they lived their lives and didn’t really seem to care how they were the odd-balls (for lack of a better word). There was much more conflict within this book than the previous one, but I don’t feel like it was overly done – it felt like it would feel, if this went down in a small town – the people talking behind backs, the rumors, the feeling that everyone is talking about you and that was just the beginning. That being said, I kind of felt the Ian storyline was bordering a bit too much on the angst storyline, I know why everything went how it did, but I don’t know – it just felt a bit too forced for me – but then as a character he just felt too different from how he appeared in the first book that it felt weird. I will be interested to see where the author goes in the last book in the trilogy as she ties up all the threads. Overall I gave Searching for Grace 3.5 stars, although it was very nearly a 4 star read for me – there were just a few things that niggled me enough that I went down half a star. I’m looking forwarding to reading the third book when it comes out.